APRIL 01, 2010 – RED DEER, ALBERTA Central Alberta Producers have a new, local choice to consider for their laboratory analysis requirements. 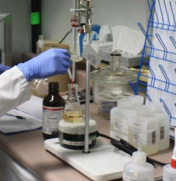 Central Labs Ltd. is an environmental testing facility located in Red Deer, Alberta, servicing residential, agricultural and oilfield testing requirements. Not a depot, it provides on-site local analysis on soil, water and oilfield samples. The laboratory, currently located at #10, 6874-52 Ave. offers a variety of analysis. Particular to local interest is soil nutrient analysis and water quality. “Successful producers treat their operations like a business; excessive fertilizer application is throwing away money, and under fertilization is missing the opportunity to maximize your productivity”, says Golay. Additionally, Golay says he is overwhelmed by the local spirit of support. Between the Red Deer Chambers’ “Local:First” initiative and the amazing support of local individuals and business, he does not think twice about moving his family, business and personal interests to Central Alberta. “I just wish I did it years earlier”, he says. This entry was posted in News on October 12, 2013 by Mitch.